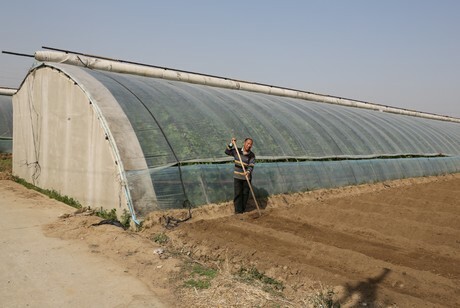 Above is a picture of a greenhouse model used widely in areas of China. In a 2015 article by LowTech Magazine, it was reported that there were at least 1,977 of these greenhouses in China. This model is low-cost and does not involve fossil fuels for heating. The transparent part can be made of plastic-foil, which is much cheaper and insular than glass. There are typically three walls surrounding the greenhouse, one of which is seen in the picture above. These walls are made of particularly insular material such as brick or certain types of rock.The three walls and accompanying material retain heat very well and release it at night when the sun is not heating the greenhouse. There are other forms of natural insulation that this model uses. Typically, these greenhouses have what can be called a massive “blind” to cover the transparent exterior. This serves as an extra layer of insulation during the night time. 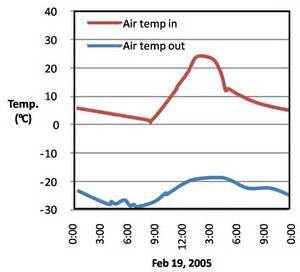 The above graph that will accompany the picture illustrates the temperature inside and outside a Chinese passive solar greenhouse in Shenyang, China in February 2005. The lowest temperature that the interior reaches is 0 degrees Celsius (which translates to 32 degrees Fahrenheit). This particular area of China gets slightly colder than the Bard area; it would be classified as a Zone 5a based on the USDA Hardiness Zone Map. Annandale on Hudson is classified as a zone b area. In other words, the information collected on the interior temperature of the greenhouse in Shenyang might be applicable to a greenhouse of a similar nature in our region. Hardier plants such as leafy greens (which would be the primary produce grown in my proposed greenhouse) can grow in temperatures 30 degrees Fahrenheit and higher. Some backup heating system in case of freezing temperatures would be necessary in the colder winter months. Otherwise, the natural heating of this design should suffice to grow hardy vegetables for Kline. This style of greenhouse is dubbed “active solar” because it requires labor for the “blind” I previously mentioned. This will not be an issue however since I am proposing that the greenhouse be managed by work study students. 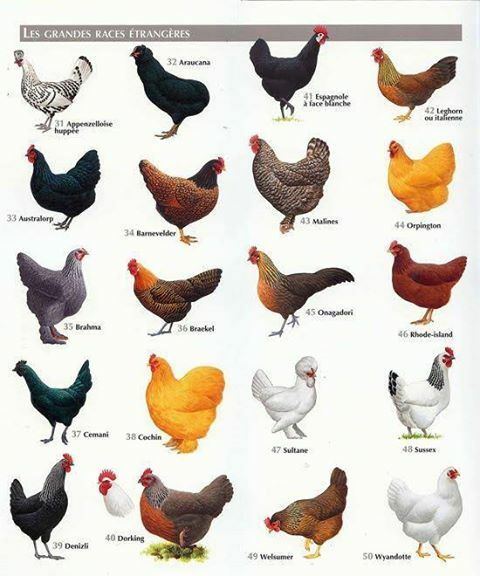 This is a photo of a successful website organization for an initiative at Dickinson College. LOCALTUNITY is a Dickinson College initiative for all students, faculty & staff aimed to build community, support the local economy, and buy and eat healthy local food together. 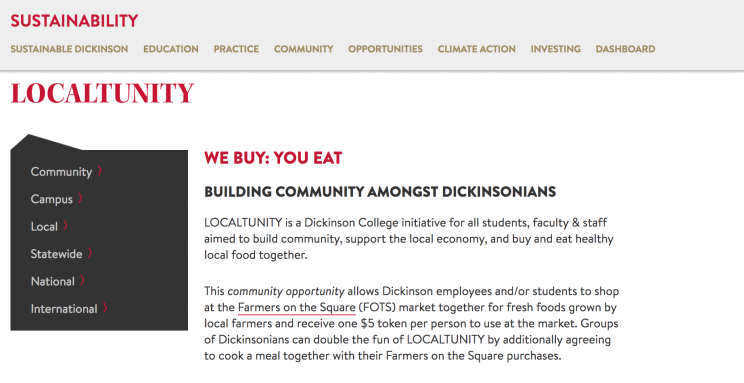 Launched in May 2014, This community opportunity allows Dickinson employees and/or students to shop at the Farmers on the Square (FOTS) market together for fresh foods grown by local farmers and receive one $5 token per person to use at the market. 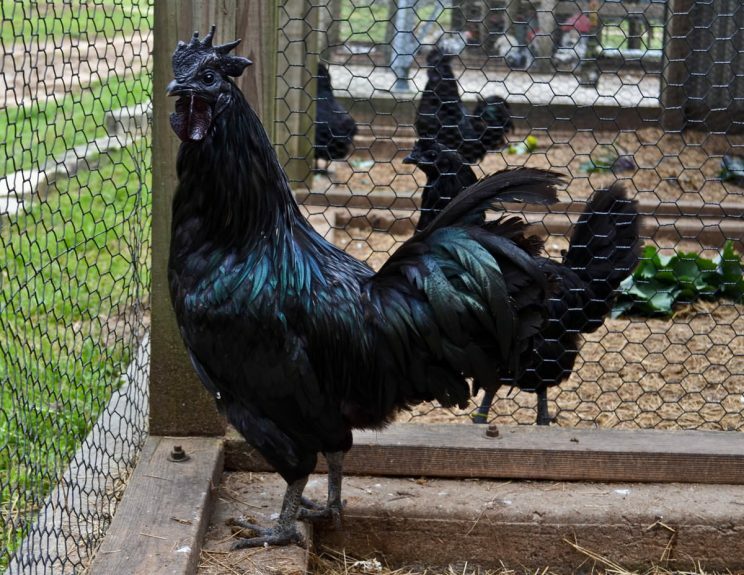 Groups of Dickinsonians can double the fun of LOCALTUNITY by additionally agreeing to cook a meal together with their Farmers on the Square purchases. When I went to Dickinson’s website, I was guided there by of one of my academic sources (as an example of a college that spends 50% of their budget on local and organic products). Their sustainability website is clean cut, well-produced and easily navigable. Localtunity and some of the other programs will be very helpful to my analysis on information flows. Scale is an important factor in change-making and communication. If you are making local change, it is relatively small scale and international change is much larger scale. By providing evidence for participating locally and at many scales beyond that, Localtunity does a good job of promoting their program. I want to incorporate this infographic to show how the use of disposables adds to the carbon footprint Bard has. 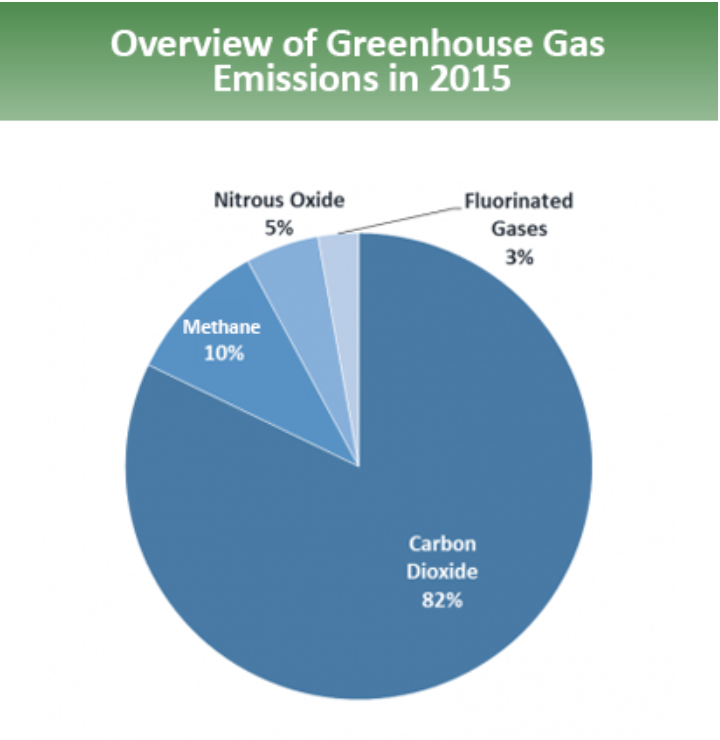 This is from the EPA Inventory of Greenhouse Gases in 2015 so it is a little dated but it provides relevant information on gases that are being emitted into the environment, of which plastics have a large role to play. My hope is that it will add to my environmental argument against disposable salt and pepper containers by showing the amount of CO2 that is released and that plastics have a large role to play in this emission. It will be part of an argument about production of plastics and the use of fossil fuels in the process of manufacturing. Hydroponics, the practice of growing vegetables without soil, is increasingly being used in organic farming. A swath of “longtime organic farmers” flooded a meeting of the National Board of Organic Farming in Jacksonville, Florida in the hopes that hydroponics be excluded by the organic label. Their argument is that hydroponics do not embrace soil health and land stewardship as a primary component of “organic”. I noticed that the language of the anti-hydroponics movement draws from the historical roots of the organic movement. They are concerned with the “founding principles” rather than perhaps the most appropriate principles. After all, as one hydroponic grower notes, “we can grow our tomatoes organically with 3 to 5 gallons of water, per pound of production, as opposed to growing tomatoes in open fields, which can use anywhere from 26 to 37 gallons of water.” On top of that, the article notes that hydroponic growing in “high-tech” greenhouses uses less land and “destroys less natural habitat”. The vote occurring in Jacksonville, Fla. was in favor of hydroponics. I think what the nay-sayers failed to do was present a topical argument. The organic movement as well as the environmental movement in general is less about traditionalism as it is about innovation. The protesters should have emphasized the excessive use of carbon for heating, cooling and constructing the hydroponic greenhouses. This would have been the more salient argument. Is soil regeneration an essential component to the organic label? Does organic food necessarily need to come from traditional farming techniques? What will the attachment to tradition do to the sustainable food movement? Will it undermine forward movement? This topic is covered in the attached NPR article from early November. Recently The Cornell Daily Sun published a feature titled “Let’s Talk Trash: How WasteNot! Is Tackling Waste on Campus,” which details the successful new sustainability measures on campus. Since 2015, WasteNot! has been conducting food audits, analyzing patterns in students’ disposable habits. The club recently concluded that clear, visual signage could combat the thoughtlessness that leads to recycling and compost bin contamination. In addition to offering students clear images of which waste products go in which bins, the signs render instructions in the five most-spoken languages on campus. While the ‘waste-way’ in Kline had similar signage for students (that is, when they were trusted to sort their own waste), there was certainly still a campus-wide ignorance of what products are recyclable, compostable, and landfill-bound. As part of my final project, I will propose that Bard dining services invest in compostable food packaging for Down the Road Cafe and Manor House. In this case, compost bins will need to be out in the campus center and in Manor House. Comprehensible signage, such as WasteNot!’s, will be essential to ensuring students are disposing of waste most efficiently. WasteNot! has also created smaller labels to put on individual dispensers and products, such as reminders that “Napkins are compostable!” and “This container is recyclable!” on á la carte sandwich boxes. These so-called “touch points” further combat the issue of unawareness. I believe marking disposable products in Bard dining halls would make students more mindful, as well. Additionally, WasteNot! is creating an incentive for the use of reusable mugs on campus. All students who opt to use their own mug or one from the “Community Mug Program,” receive a 25-cent discount in á la carte cafes. Cornell’s WasteNot! initiatives have proven to be impactful (the contamination in bins outside of their cafeteria alone has dropped by 10% for landfill, 17% for recycling and 19% for compost). Cornell is a much larger institution than Bard, giving me hope that simply educating students can increase cognizance, especially as one of my arguments for managing disposable waste is bettering students’ waste literacy. Do you think Bard students will be receptive to adopting initiatives similar to those of Cornell’s WasteNot! club? Four Boston elementary schools are making Janet Poppendeick proud – testing the practicality of cooking with fresher ingredients and engaging students. Since May, the students of Bradley Elementary, Patrick J. Kennedy, the East Boston Early Education Center, and East Boston High School have been offered healthy options in a compelling way. Quality and intrigue is a recipe that yields healthy children and nourished minds. Journalist Steve Holt describes the cafeteria lines at Manassah Elementary’s cafeteria as being impressively filled with salad greens, black beans, seasoned chicken, and vibrant broccoli (steamed by an actual chef). The offerings and do-it-yourself design resemble those of a Chipotle – an interactive experience, not merely a passive one. Resetting the expectations of students and redefining what it means to eat healthily is a revolutionary initiative, but limited due to a lack of funding. Poppendieck would argue that there should be no need for private involvement, and that there should be an increase in federal nutrition subsidy. But, is this a realistic expectation? Should parents and guardians be asked to pay – in addition to taxes to ensure their kids are eating well-sourced and prepared foods? I’m not suggesting that school food is a privilege, but I do wonder when standards become a luxury.